Putting together a fast, easy, healthy meal doesn’t have to be difficult. Below I put together this quick, healthy dinner for one of my nieces that took me all of 5 minutes. And the great thing is she actually liked it! Avocados are loaded with healthy fats, fiber, and vitamins so they’re great to add to any meal. Try to choose organic, free-range eggs as their nutrient content is higher than conventionally raised eggs. So these chips are kind of the exception to the rule. As you can see it’s pretty easy to make healthy meals in very little time! And this is important for busy people who don’t have a lot of time for cooking. If a 4 year old likes it then I’m pretty sure you will too! Please be sure to leave a comment below to let me know what you think! 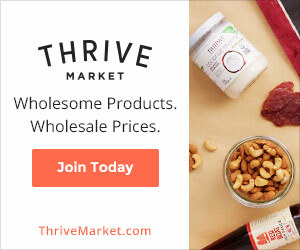 Full Disclosure: I am an affiliate of Thrive Market. She is absolutely darling! This sounds like a meal I would enjoy also and I never really thought of buying grass-fed cheese. Thanks for these quick tips that help with my busy schedule!